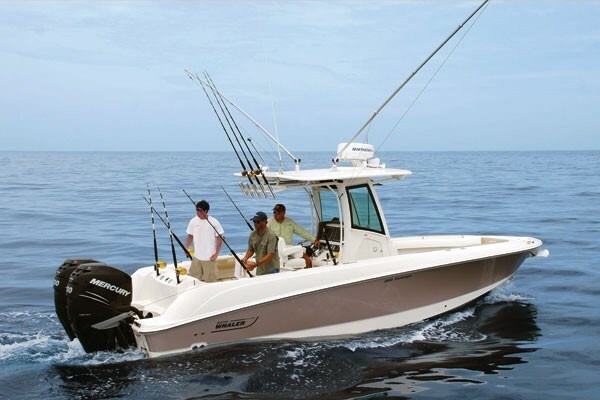 The 2010 Boston Whaler 280 Outrage continues to lead the center console fishing boat market with an amazing list of innovations. We tested the 280 Outrage in Miami out on Biscayne Bay, the test boat was fitted with twin Mecury Verado 300 4-stroke outboards. The 280 sports a console cooler with a cushion and backrest that hides in the foredeck to please those who prefer to sun worship to fishing. A removable cockpit table is located in the center console. The hardtop’s support legs blend into the wrap around enclosure with it’s full windshield, electric windshield vent and wiper. The helm station cradles the driver and companion in a pair of bucket seats with folding armrests. There are also thigh bolsters that can flip up to provide a leaning post. The boat also true to it’s heritage as a fishing machine, with plenty of rod holders, lockable storage for rod/reel combinations and other fishing equipment. Of course with the Unibond construction, the famous unsinkability comes as standard equipment. Foldaway trolling seats amidships provide an ideal place to watch your trolling rods. The hull delivered outstanding performance with top speeds in the 60mph range. Quiet, stable in the 2 foot chop of Biscayne bay, the ride was surprisingly smooth and dry. Full power turns were well mannered and with little loss of speed. The Verados provided great out of the hole torque. The Whaler reps, said that the acceleration times between the 225, 250 and 300 hp. Verados were exactly the same, with the only difference being in the top end speeds with the different power choices. Once again the 280 Outrage does not disappoint as a Boston Whaler, good features, outstanding performance and great construction.